The development of galleries and other agencies for increasing the knowledge and enjoyment of Fine Arts in southern California. is a matter of special gratification to the Fine Arts Gallery of San Diego. In the opening, a short time ago, of the Laguna Beach Art Association’s new home, this gallery has an intimate interest, for several reasons. 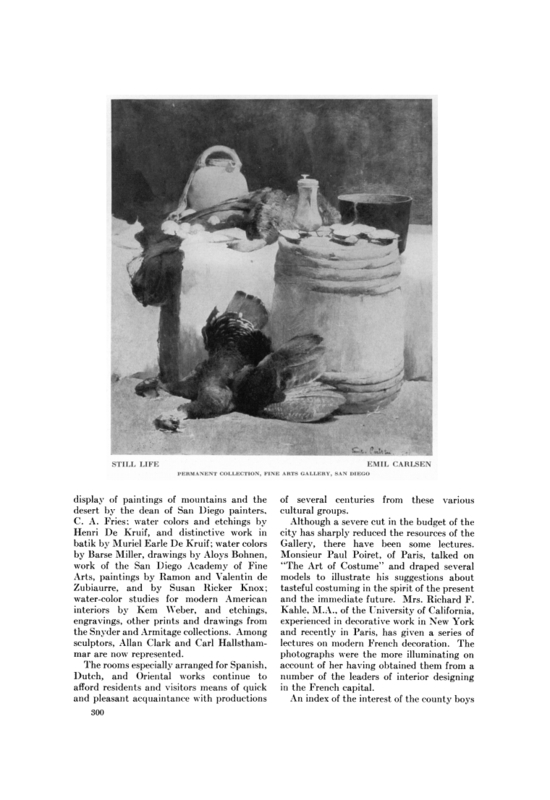 Artists of the Laguna Beach Association were very generous in sending original oil paintings for circulation in the schools of San Diego County; they have contributed a number of the most significant pictures that have been shown in southern California exhibitions arranged here, and they have, in many other ways, stimulated the production and the enjoyment of the Fine Arts in the West. The new El Prado studio and gallery in San Diego, managed by Mrs. Esther Stevens Barney, skilfully provides for the showing of a few pictures in a home-like atmosphere. The design of the room, the old furniture, the use of flowers and prints contribute to a very fortunate arrangement for the presenting of works by various local painters. Another institution near by, the public gallery in La Jolla. continues to show each mouth interesting works of art. The emphasis that the Fine Arts Gallery, San Diego, has always had upon modern American art, and its desire to have productions from Spanish, Oriental and other fields, have been remembered in the additions to the permanent collection that have been made within the last few mont hs. From the father-and-son exhibition by De Witt and Douglass Parshall have come “The Grand Canyon by Moonlight,” by De Witt Parshall, and “The Freight Yards” by Douglass Parshall. An American painter of the immediately preceding era, Max Bohm, is represented by “The Raising of Lazarus,” given by Mrs. Henry A. Everett. Miss Edith A. Hamlin, a very tactful and successful teacher of young children, who has been a resident of San Diego for some time, has presented a drawing of trees in black and white, and a woodland study in colors. A gilf to the gallery in memory of Mrs. Kelville A. Klauber, a large painting, “Thanksgiving Still Life” by Emil Carlsen was secured from an artist who has possessed it since it was painted in the 90’s. From the Orient have come cricket houses, with tops of carved jade or bone or ivory, given by Mr. George D. Pratt, and a large Burmese Buddha, given by Mr. and Mrs. Erskine J. Campbell. A rich sixteenth century Spanish cope, with flowers in colors and much gold thread on a, white ground, has been donated by Mrs. Appleton S. Bridges, and an etching by Armin Hansen, procured from the California Print Makers’ Society. Two photographers of insight, skill, and poetic feeling, men who have received honors in Europe as well as in salons in this country, Harold A. Taylor and Wayne Albee, have contributed some of their most beautiful pictures to the permanent collection. Winslow Homer and Elihu Vedder are represented among the loans, Homer by a water-color study of a woman and Vedder by a Christmas card made in Rome. Recent exhibitions have provided a representative display of paintings of mountains and the desert by the dean of San Diego painters, C. A. Fries: water colors and etchings by Henri De Kruil, and distinctive work in batik by Muriel Earle De Kruif: water colors by Barse Miller, drawings by Aloys Bohnen, work of the San Diego Academy of Fine Arts. Paintings by Ramon and Valentin de Zubiaurre, and by Susan Hicker Knox; water-color studies for modern American interiors by Kem Weber, and etchings, engravings, other prints and drawings from the Snyder and Armitage collections. Among sculptors, Allan Clark and Carl Hallsthammor are now represented. The rooms especially arranged for Spanish. Dutch, and Oriental works continue to afford residents and visitors means of quick and pleasant acquaintance with productions of several centuries from these various cultural groups. Although a severe cut in the budget of the city has sharply reduced the resources of the Gallery, there have been some lectures.Monsieur Paul Poiret, ol Paris, talked on “The Art of Costume” and draped several models to illustrate his suggestions about tasteful costuming in the spirit of the present and the immediate future. Mrs. Richard F. Kahle, M. A., of the University or California, experienced in decorative work in New York and recently in Paris, has given a series of lectures on modern French decoration. The photographs were the more illuminating on account of her having obtained them from a number of the leaders of interior designing in the French capital. An index of the interest of the county boys and girls in the classes in drawing, modelling, linoleum cutting, design, pottery, and other subjects is the fact that they voted to come even in vacation week for the lessons provided by the Fine Arts Gallery. RALPH MORRIS, Assistant to the Director.